The ARES Speedy Brake Pad Spreader makes it easy to correctly reset the piston and ensure that your car is safe and your brakes are well-maintained. Made of superior-quality Carbon Steel mixed with Chrome Vanadium steel for optimal durability, this tool is corrosion-resistant and ergonomically designed to reduce hand stress and fatigue. All you have to do is lodge it between the pads and squeeze the trigger to get the job done. It's that easy! DESIGN CONSIDERATIONS - The ARES Speedy Brake Pad Spreader is made of superior-quality Carbon Steel mixed with Chrome Vanadium steel for optimal durability. 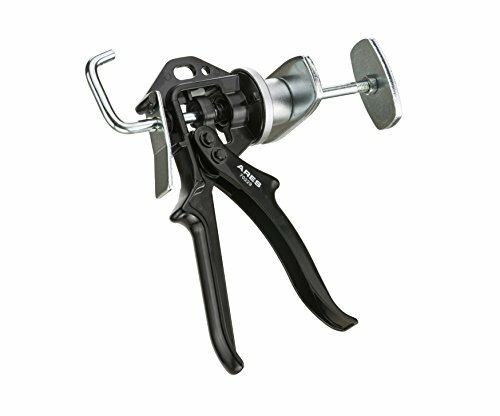 This tool is also corrosion-resistant and ergonomically designed to reduce hand stress and fatigue. WHY YOU NEED IT- Your brake pads need regular maintenance in order to ensure maximum safety while driving. Doing it yourself is extremely easy and can save you time and a ton of cash! EASY TO USE - Designed with great attention to detail, this handy and reliable brake pad spreader can be easily used by everyone. All you have to do is lodge it between the pads and squeeze the trigger. Its smooth action will correctly reset the piston. It's as simple as that to make sure that your car is safe! RELIABLE | EFFECTIVE | EFFICIENT: Users trust ARES to be quality tools. You are backed by our Performance Assurance. If you have any issues with your ARES speedy brake spreader, simply contact customer service for troubleshooting help, parts, replacement, or refund. If you have any questions about this product by ARES, contact us by completing and submitting the form below. If you are looking for a specif part number, please include it with your message.